Friday’s episode of The Ellen DeGeneres Show featured a very special segment with Super Bowl LIII MVP Julian Edelman. 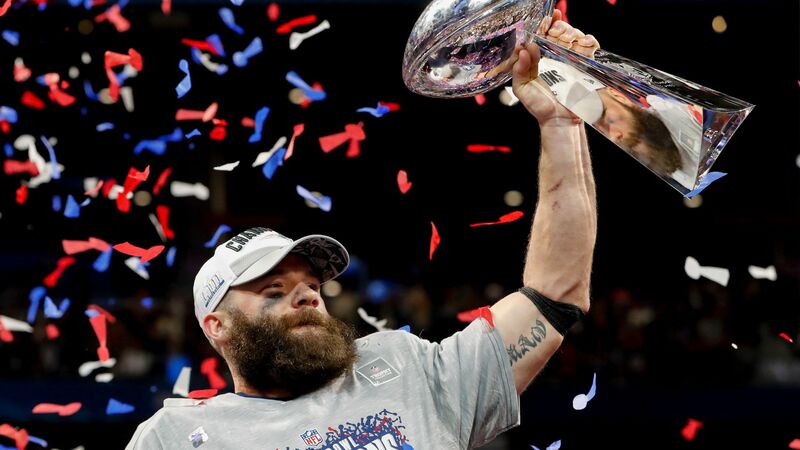 In addition to chatting with him about what it meant to bring home another championship win for the New England Patriots, DeGeneres asked Edelman tough questions about his football season growth: namely, the growth of his beard. Then DeGeneres offered to trade a charitable donation for the chance to shave Edelman’s beard, which made for an interesting twist to the conversation. He noted that his father, who didn’t have a paternal presence in his life, pushed him hard; he also noted that his mom is “a loving little lady” who made sure that he was never late to practice and that he was always taken care of. “This is a full family kind of win, I think,” Edelman said. For winning MVP, the NFL presented Edelman with a silver football, though he said he didn’t take it straight home from the big game. DeGeneres surprised him when she revealed that instead, the NFL sent the trophy to her show so that she could present it to Edelman during his appearance. After the two talked about the big game, his training regimen and how he gets past players on the opposing team who are trying to grab at him, DeGeneres turned the conversation toward Edelman’s beard, which he said he has been growing all season without even a trim. “Coach Belichick has this thing that he says, ‘Put everything in the drawer and [don’t] worry about it until it’s done,’ so I put my razor actually in the drawer,” Edelman said. “He’s a scary, intimidating man. We’ve only had four conversations in the 10 years I’ve played for him,” he joked. Edelman allowed DeGeneres to touch his beard. She commented that it’s “bushy,” then asked if he ever gets food stuck in it — which, apparently, he does. DeGeneres then made Edelman a deal: if he allowed her to shave his beard, she would donate $10,000 to the Boys and Girls Clubs of America, a charity he works with often. DeGeneres quipped, “Goodbye, beard,” and got to work. Indeed he does, but what’s even better is that he and DeGeneres will cumulatively donate $20,000 to the Boys and Girls Clubs of America. DeGeneres even joked about auctioning off the shaved beard hair to members of the audience, also for charity. Luckily, though, she didn’t follow through. That may have been just a step too far.